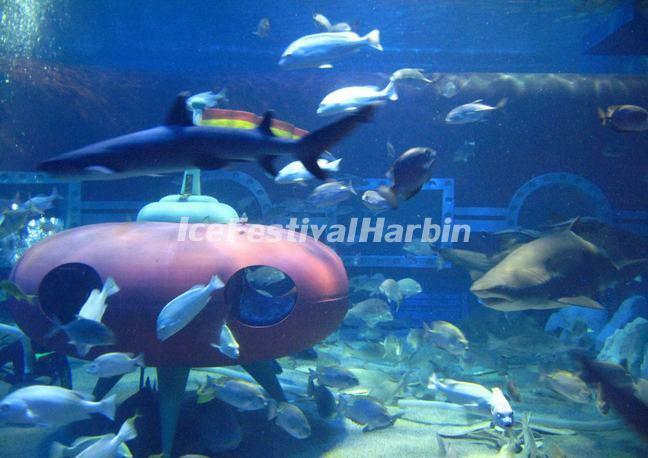 Harbin Polarland is the first theme park of polar land scenes in China. There is the pure penguin family of South Polar and the first South Pole penguin baby in the world, Manbo, which was successfully hatched in the inland city. You can see the most active polar bear brothers in China fighting furiously and breeding. There are also the wild arctic wolves introduced for the first time in Asia and the arctic fox brothers who can run on the running machine. Harbin Polarland is the best place that will get you out of the cold in winter. The displays are well presented and the park has a large range of fish, sharks, dolphins and other sea or river creatures. There are two shows, a whale show and a sea lion show, in the park which run four times daily. 1) Tourists can take public bus (CNY 1) No. 13, 29, 88, 119, 125, 126, 211, 212, 213, 219, 346, 551, and 552 to the Sun Island Road Junction (太阳岛道口tài yáng dǎo dào kǒu ), where you can change the free bus (offered by the park) to the park. 2) The free busses also leave from the Wangjiang Hotel at 9:30am, 10:30am, 1.30pm and 2:30pm and from the Science and Technology Museum (科技馆kē jì guǎn) every fifteen minutes between 8:30am and 3:30pm.